Life of Pie is a friendly local Cafe and Bakery offering famously delicious pies and eats in Murrurundi. There's nine flavours of the popular 210 gram pies, including vegetarian options, as well as assorted cakes, slices and tarts. Sample daily made gourmet sandwiches and a range of freshly baked sourdough (Vienna, Parmesan & onion, Lite Rye, Multigrain). Peaberrys coffee & hot chocolate made on bottled water will surely satisfy, though you could also enjoy a cold drink. There's penty of parking out the front and off street, travelling caravans will have no trouble finding space to stop. Enjoy eating inside or outside, outside is dog friendly. 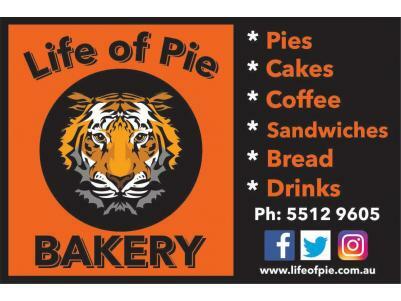 Life of Pie, Bakery and Cafe on 13 Mayne Street (New England Highway) Murrurundi NSW.